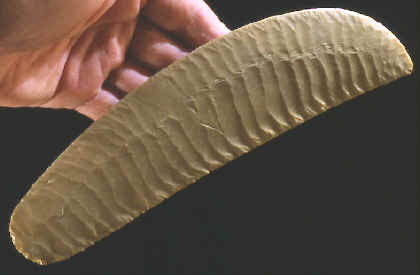 Some of the most skillfully flaked stone artifacts ever made during the late Stone Age anywhere in the world are Gerzean "Ripple Flaked" Knives. They represent a high point in flintknapping technology and are certainly the product of full time craftsmen. These knives date to the Gerzean and early Protodynastic eras between 5,400 & 5,150 years ago and are characteristic of the Predynastic period of Egyptian prehistory. Most known examples of Gerzean knives have been purchased, but it is presumed they came from looted tombs. Some documented examples are known from tombs and rare broken specimens, from major settlement sites. They were high status objects and may have been used in sacrificial rites. In a few instances they have survived with richly decorated gold foil and carved ivory handles. Some of the carved images include goddesses, heroes and a scene of a boat battle. 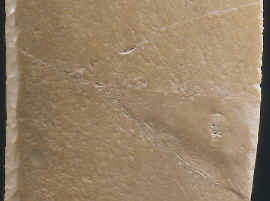 Many Ripple Flaked Gerzean knives show signs of deliberate breaking, suggesting they were ritually "killed" before being interred with the dead. Breaking the knife so that it was no longer useful may have been seen as either a way to prevent its after life "magical" continuance or to prevent any living person to ever use it again. This Gerzean Knife was apparently ritually "killed" by striking it in the center of the blade. It measures 8 ¼ inches (22cm) long and 2 3/16 inches (5.5cm) wide.